Of all the cars to have come out of Detroit, the Oldsmobile Toronado must be one of the biggest! This two-ton leviathan hit the road in 1965. 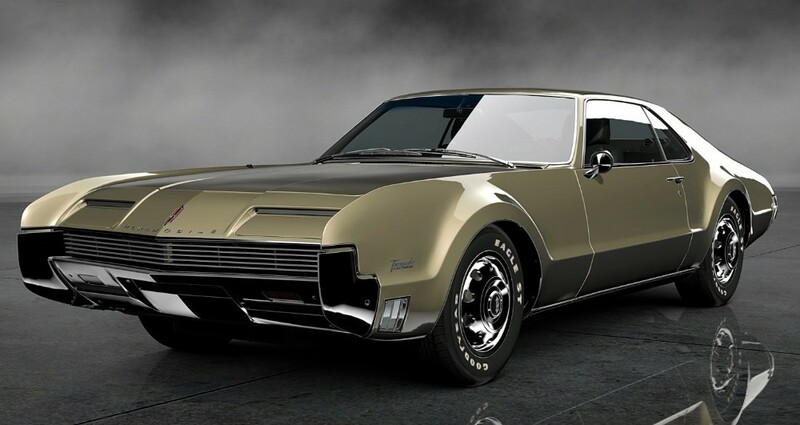 The Toronado was the first mass-produced American car to be fitted with front-wheel drive. As a result, it handled better than its rivals. 60% of the Toronado's weight was over the front wheels. Torsion-bar suspension sealed the stability deal, at the front end. Well, that, and two of the tyres Firestone had made especially for the Toronado. They came with stiffer sidewalls - and extra grip. Wheels were slotted - to cool the finned brake drums. Power was provided by a seven-litre V8. Dubbed the 'Rocket', the engine produced 385bhp - giving a top speed of 130mph. Intricate work went into mating the motor with the 3-speed Hydra-Matic 'box. Rubber insulation was provided. All that sat in a solid, perimeter-framed chassis. The Toronado was avant-garde in its styling, too. Clean and vibrant lines set it apart. And its headlights' electric flaps were a sweet touch. Alec Issigonis - designer of the BMC 'Mini' - predicted that large engines would never successfully be twinned with front-wheel drive. Historic automobile that it was - the Oldsmobile Toronado proved him wrong!